Split pea ranks up there as one of our all time favorite soups. Always comforting, always satisfying. Yours looks hardy and delicious. Love your daffodils. We spent the winter south and missed ours. They are perhaps my favorite spring flower. I'm pretty fond of daffodils, Sam. (And my lilacs.) and I'll always love split pea soup. I so love split pea soup, I wish the family would eat it. It remains one of those foods that I make and eat for lunch for a week. I'll be over. I love ham and bean soup with navy beans, too, Mary. COme to think of it, any bean soup! We've had a run of a few great days and now I'm eating my words. Still, the soup's great anytime! I too enjoy a good split pea soup. This looks mouthwatering! I didn't go to the Martha trouble of making croutons, Angie. Another day. Making something new from last night's dinner is nearly a hobby for me, Marta! A couple new ingredients, a spice or herb, and voila! New again. Thanks, Mary, I hope you do try it. It's a darn good soup. Just be sure to cook the peas to your preference for softness. Gotta love what mother nature brings us. If it's not the rain, probably won't make this delectable soup in Spring, right? :) And you're so right, a soup this hearty doesn't need to be accessorized! My mom never made it, Kale, and my only childhood memory came from a can. Maybe it's better these days, but a hearty homemade version like this is the best! Spring is so fickle, isn't it? But I love your perspective. Those colder days are a perfect excuse to make a pot of soup! And this split pea soup looks perfect. Thank you for sharing, my dear! I guess every season is kind of fickle. But I'm so ready for steady warm weather, Monet, soup or no soup! I think that if we are really quiet, Colorado might just slip into summer without spring noticing. If I see one more snowflake . . . These daffodils made me smile. I love them and split pea soup. 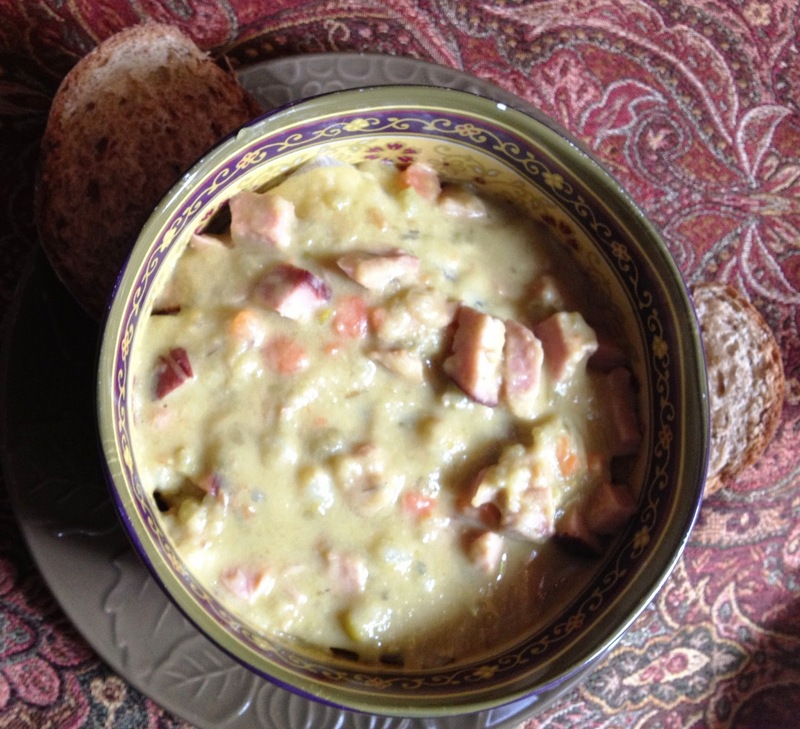 I have warm and vivid memories of my mother making split pea soup every spring! Such comfort food! I love your daffodils too Rosemary! Such happy flowers! It is a grey day outside so your burst of daffodil gold did my heart wonders. This thick soup is a perfect winter warmer (even though it is supposed to be Spring... ) I'm ready for warmer weather too. Sigh! I certainly love soups of different kinds and flavors. This is another recipe to be added to my collection. Thanks a lot for sharing your wonderful soup recipe. I can’t wait to try it at home. Isn’t it ironic? It’s summer yet it seems its starting to rain outside. Quite funny!